When members of the Willamette Falls Heritage Area Coalition (WFHAC) submitted a formal feasibility study to Martha J. Raymond, national coordinator for heritage areas at the National Park Service, in late July, they had reason to feel confident. After all, the feasibility study — which was 10 years in the making and laid out a detailed case for why a 56-mile stretch of the Willamette River near Willamette Falls should be designated as the West Coast's first National Heritage Area (NHA) — had already been reviewed by National Heritage Area Program Regional Coordinator Linda Stonier, who told WFHAC representatives in May that the study met all 10 of the criteria to receive the coveted NHA designation. That feedback was cause for celebration, but the WFHAC still needed a final seal of approval from Raymond, who is based out of Washington D.C. And in a press release Oct. 31, the WFHAC announced that it had received just that in the form of a Sept. 7 letter from Raymond. "While it is not our role to offer a recommendation regarding National Heritage Area designation until the NPS is asked to provide testimony on a bill before Congress, we have reviewed the study," Raymond wrote. 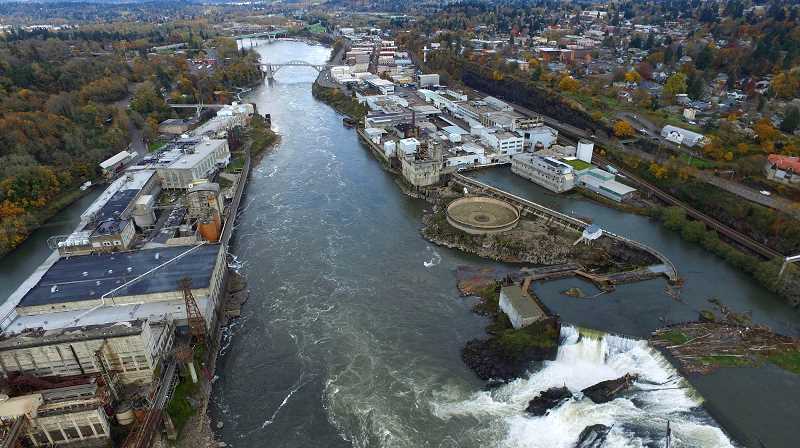 "Based on our review, which was conducted with Linda Stonier, National Heritage Area Coordinator for the NPS Pacific West Region, and with Paul Lusignan, National Register of Historic Places, we find that the Willamette Falls Heritage Area Feasibility Study meets all 10 feasibility study criteria." "This is such a significant milestone in our march forward to becoming a National Heritage Area, the first on the West Coast," WFHAC President Jon Gustafson said in the press release. "According to Linda Stonier, the criterion established by the Park Service is incredibly stringent. They apply it to evaluate whether (the study) describes a landscape with a 'nationally important study,' and whether the study documents a nationally significant assemblage of resources and heritage sites for conservation, interpretation and use … we've met that tough standard." Designated by Congress and overseen by the National Parks Service, NHAs — of which there are 49 across the United States — are "places where historic, cultural and natural resources combine to form cohesive, nationally important landscapes." Specifically, one of the aforementioned 10 criteria states that those resources should "represent distinctive aspects of American heritage worthy of recognition, conservation, interpretation and continuing use." NHAs must also "reflect traditions, customs, beliefs and folk life that are a valuable part of the national story" while providing an array of conservation, recreational and educational opportunities. The idea behind the Willamette Falls heritage area is to tell the story of the falls — which were a crucial gathering place for the first Native Americans to settle in the area — and how they influenced the growth of culture and industry up and down the Willamette River. "Our geologic foundations, tremendous waterpower, fertile soils, natural abundance and mild climate once combined to inspire settlement and enterprise in this key western destination — and it holds us here today," WFHAC representatives wrote to Raymond in a cover letter for the feasibility study. Currently, the westernmost NHA is the Great Basin National Heritage Area in Nevada and Utah. Most NHAs are concentrated on the East Coast, and they include the Niagara Falls National Heritage Area in New York, the Oil Region National Heritage Area in Pennsylvania and the Journey Through Hallowed Ground National Heritage Area, which stretches across parts of Maryland, Pennsylvania, Virginia and West Virginia. Perhaps the most important takeaway from Raymond's letter of affirmation is that the Park Service will be willing to testify on WFHAC's behalf as they face their final hurdle: approval from Congress. According to WFHAC Executive Director Siobhan Taylor, the group will spend the rest of the year preparing legislation that will be introduced to Congress in 2019 by a delegation led by Congressman Kurt Schrader. "Now the real work begins as we continue to strengthen our relationships with upriver partners, honor tribal traditions and begin the arduous legislative process," said Alice Norris, the editor of the feasibility study, in the press release. "This is going to take time and resources, and the support of our partners and communities."